When there are 50 wineries in a room and just three hours for tasting, it makes for hard choices. In fact, Liberty Wines, the sponsor of Taste BC, made choosing even tougher by allowing several craft brewers, three spirit producers and two cideries in the room as well. My last stop of the evening was at the table of the Howe Sound Brewing Company, which was showing four terrific beers (Total Eclipse of the Hop IPA, Super Jupiter IPA, Pothole Filler Imperial Stout and Wee Beastie Oak-Aged Scotch Ale). These are all seasonal beers in 750 ml bottles, priced between $7 and $10 a bottle, and worth it. I did not linger at the other beer tables because Liberty is sponsoring a craft beer tasting on March 20. Put it on your calendar and watch for more details. One of the first tables I hit was that of Fairview Cellars because owner Bill Eggert is always entertaining and always has good wine, including a couple under the table. This year, those wines included a Pinot Noir under his new Eagle Bluff Estates Label and a 2006 Cabernet Sauvignon. The latter is no longer available but it has matured to such a lovely wine that it makes the case for ordering his 2009 Cabernet Sauvignon ($40), if it were not already sold out. Wait for the 2010. Here are notes on Bill’s wines. Eagle Bluff Estates Crooked Post Pinot Noir 2011 ($25). This wine is made from the first harvest from young vines, which explains that the wine has the colour of a rosé. When you take a sip, the wine pulls the usual Pinot Noir stunt of having a lot more substance than the colour suggests. With aromas and flavours of strawberry and with a silky texture, this is charmer. 88. Fairview Cellars Sauvignon Blanc 2011 ($19.90). The wine has aromas of herbs and sage, leading to flavours of sage and grapefruit and grapefruit rind. The finish is bone dry. 88. Fairview Cellars Cabernet Franc 2011 ($N.A.). This is a classic expression of the variety, with brambly ar0mas and with blackberry flavours. The spicy finish is one reason why Bill recommends pairing this wine with Greek food, tandoori chicken or satay pork. 90. Fairview Cellars Two Hoots 2010 ($24.90). Named for vineyard owls, this is a blend of Cabernet Sauvignon and Merlot (the Fairview vineyard grows primarily Bordeaux varietals). The wine shows a touch of mint and eucalyptus on the nose, going on to cassis and cherry flavours and a spicy finish. 90. Fairview Cellars Madcap Red 2009 ($26.90) and Fairview Cellars The Bear 2009 (34.90) are also sold out. Lucky were those who got a few cases. Bordeaux blends from this outstanding vintage, these are 91 and 92 point wines respectively. And lucky for those who stopped at the Fairview Cellars table. Here are notes on wines from other wineries that are still available. Averill Creek Pinot Gris 2009 ($15.99 for 800 cases). The vibrant acidity of the Vancouver Island terroir is keeping this wine appealingly crisp and fresh while the time in the bottle has enhanced its complexity. The aromas and flavours of pear and grapefruit are delicious. 90. Averill Creek Somenos Rosé 2011 ($17 for 400 cases). While the 2011 vintage on the island was tough for maturing red varieties, Averill Creek managed to make an excellent rosé with some of its Pinot Noir. The wine is fresh and tangy with flavours of strawberry and cranberry. 88. Averill Creek Pinot Noir Reserve 2009 ($60 for 250 cases). This won a gold medal in the recent Canadian Wine Awards. The quality justifies the price. The wine, which was aged 15 months in French oak, begins with those complex aroma notes – tea, spice, cherry – that sometimes are called barnyard, a positive descriptor with Pinot Noir. On the palate, there are flavours of cherry and raspberry, with a spicy (cloves, nutmeg) finish. The texture is silky. 91. Bartier Brothers The Cowboy White 2011 ($22.90). This is 83% Chardonnay, 17% Sémillon, one of several wines from the winery being developed by winemaker Michael Bartier and his brother, Don. The wines are made and sold through Okanagan Crush Pad Winery, where Michael is also the chief winemaker. This is a crisp white, with flavours of apple and melon and with a lingering spicy note on the finish. 89. Bartier Brothers The Cowboy Red 2011 ($22.90). This is an unconventional blend: 40% each of Gamay Noir and Merlot, with 30% Pinot Noir. The Merlot brings substance to the texture and a hint of blueberry. Its partners add cherry flavours and soft, approachable tannins. 89. Bartier Brothers Chardonnay 2011 ($22.90). An unoaked Chardonnay, this crisp and zesty wine has appealing flavours of lime and grapefruit. 90. Bartier Brothers The Goal 2010 ($29.90). This is a blend of 40% Merlot, and 30% each of Cabernet Franc and Syrah. The wine delivers satisfying gobs of fruit aromas and flavours, including plums, black currants, black cherry and a hint of pepper. 90. Misconduct Misfit 2009 ($18). Misconduct Wine Co. operates from a wine shop on Upper Bench Road in Penticton. The winery has created a 1920s personality for its wine names, labels and website, although the wines manage to have a contemporary appeal. This white is 39% Pinot Gris, 38% Chardonnay and 23% Viognier – “three ritzy gals dancing their way to Tin Pan Alley,” as the website has it. This win has abundant melon and tropical fruit flavours, with a crisp and dry finish. 88. Misconduct Massacre Rosé 2010 ($20). Juice from seven red varieties is combined in this terrific rosé. The back story involves the St. Valentine’s Day Massacre in Chicago in 1929 when gunmen associated with Al Capone shot seven rivals. The story may not be appealing but the wine is, with aromas of strawberry and raspberry, flavours of strawberry, raspberry and blackberry and a texture that is juicy. 90. Misconduct The Big Take 2009 ($26). This is 45% Merlot, 30% Cabernet Sauvignon and 25% Cabernet Franc, aged 12 months in French and American oak. It begins with black currant and vanilla aromas and delivers flavours of currants, blackberries and chocolate. 89. Misconduct Pinot Noir 2009 ($30). Big and full-bodied, this wine begins with aromas of black cherry mingling with forest floor notes. On the generous palate, there are flavours of black cherry with a touch of coffee. 90. 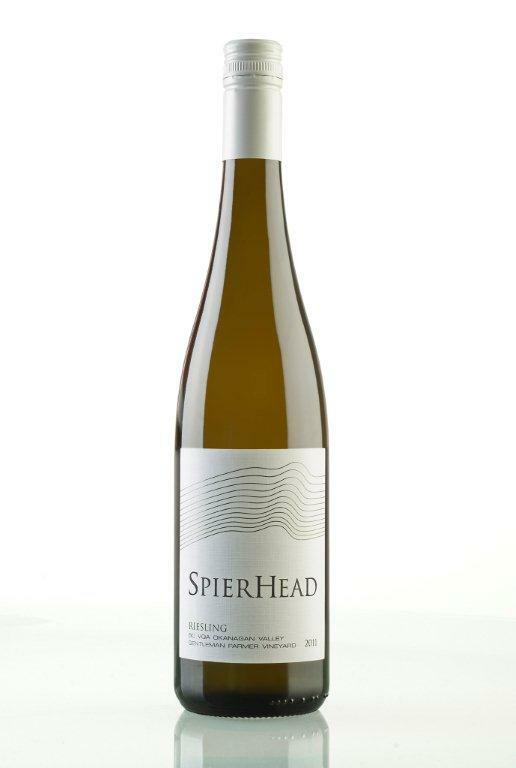 SpierHead Riesling 2011 ($21.90 for 185 cases). This wine begins with a touch of petrol and citrus in the aroma, leading for refreshing flavours of lime, with minerals in the backbone. However, the texture is juicy, with the residual sugar nicely balanced with racy acidity so that the finish seems dry. 89. SpierHead Chardonnay 2011 ($21.90). An appealing, fruit-forward Chardonnay, this begins with citrus aromas, leading to flavours of lime, guava, melon and peach, with cloves on the lingering finish. 90. SpierHead Pinot Noir 2011 ($19.90). The previous vintage was judged the best Pinot Noir in the Canadian Wine Awards last year. This one proves that the wine was not a one-shot wonder. This is an elegant, delicate wine, with appealing flavours of raspberry and cherry and with a silky texture. 90. The View Winery Riesling 2011 ($17.90 for 379 cases). Here is another Riesling in which the residual sugar is balanced well with the acidity to gave the wine a juicy, savoury impression on the palate. It begins with aromas of citrus and has flavours of lime and green apples. 89. The View Winery Red Shoe White 2011 ($15.90 for 389 cases). This is 82% Gewürztraminer, 18% Riesling, with enough residual sugar to give it an off-dry finish. There are aromas and flavours of apricot, melon and baked apple. 88. The View Winery Pinotage Reserve 2009 ($22.90 for 56 cases). One of only three producers of Pinotage in the Okanagan, The View does a solid job with this South African varietal. This wine is full-bodied and rich, with flavours of black cherries, prunes, chocolate and spice. 90.